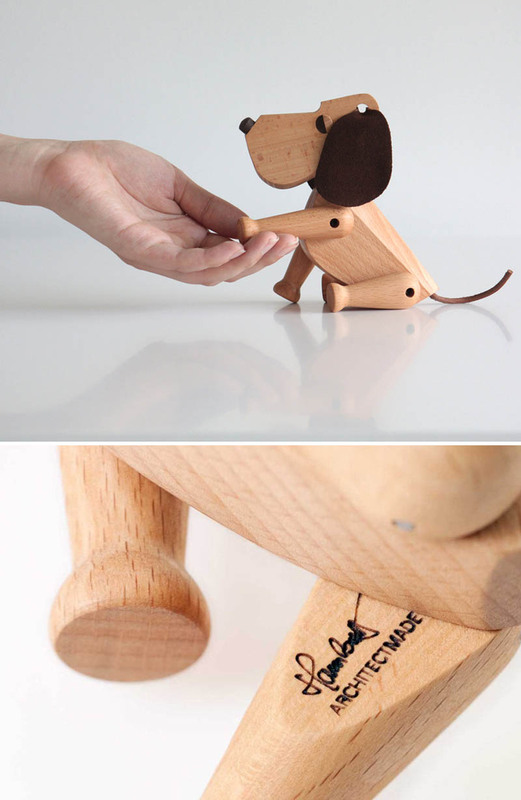 Hans Bolling Oscar Wooden Dog by ArchitectMade. A beloved Danish design icon returns! Hans Bolling's wooden Oscar the Dog toy from Denmark. Designed by Hans Bolling in 1953, Oscar is an elaborately designed dog with a flair for refined simplicity. Every angle, curve and bend has been thought out to convey a highly stylized, yet harmonious aesthetic object. The highly specified and elaborate details of Oscar's body add a sophisticated dimension to his form. Best of all, Oscar's body can be arranged so that he does everything a normal dog would. He can sit, stand, beg or even sulk in the corner if you have been away from him for too long. This classic Hans Bolloing Oscar Dog figure comes packed in a beautiful gift box. Material: Maple and Wenge wood, leather. Size: 5" h x 6" l.